As one of the most modern and breathtaking arenas in the world, Wembley Stadium connected by EE opened in 2007 and was built on the site of the earlier Wembley Empire Stadium, which was demolished in 2003. A UEFA category four stadium, Wembley Stadium hosts major football matches as well as other major sporting and music events. With 90 000 seats, 34 bars, 98 kitchens, 8 restaurants and 688 food and drink service points, it is the largest stadium in the UK and the second largest in Europe. Thorn has been a lighting partner to Wembley Stadium since the 1970s, originally illuminating the Empire Stadium and in 2007 equipping the new stadium with the vast majority of its luminaires.In 2004 Thorn achieved full approval to supply lighting to Wembley Stadium following a successful tender process which involved carrying out lighting calculations for every room and area (except emergency signage) using the specified lighting package of AG132. In 2014 Thorn replaced the stadium's iconic arch lighting with a custom LED lighting system designed for full colour as well as special moving light effects. The new lighting means the arch can be illuminated in an endless range of colourful possibilities. Roger Maslin, Wembley National Stadium Ltd Managing Director, explains: "We can now use the arch to make big, bold and entertaining statements which can be seen right across London. With so many lighting scenes the possibilities are fantastic. From the St. George's Cross and team colours to highlight goals for big games, to solid and moving colours for event lighting, to the corporate colours of our sponsor EE and charity partners. The lighting is transformational and exciting." Pat Holley, Senior Lighting Designer at Thorn, who helped to create the lighting design scheme throughout the project, explains: "The arch's lighting system consists of a dynamic floodlight with red, green, blue and white LED chips. 50% of the LED chips are white and the remaining are equal quantities of red, green and blue. 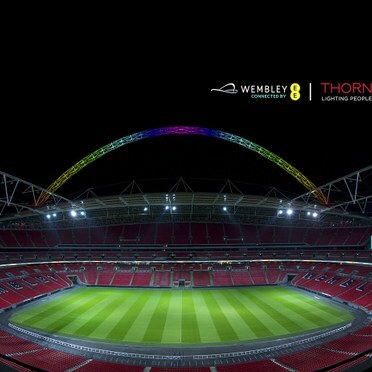 This will allow The Arch to have unlimited lighting effects - both dynamic or static - with colours and movement to suit events and occasions" Kevin Stubbs, UK Technical Manager, adds: "Importantly, Wembley wanted the new 'whiter' LED white to match the white achieved with the old metal halide system. We therefore had to tune the LED white to achieve this consistency." 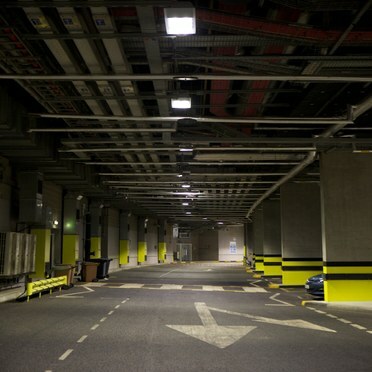 Wembley's onsite specialist subcontractor, Hollandia - an expert in the access and maintenance needs of the arch - installed the new lighting comprising 228 RGBW LED floodlights. To speed up installation Thorn coordinated and designed a custom bracket to allow the existing fixings to be used. The heart of the new lighting solution is the controls system, designed by Thorn together with a partner which brings the endless possibilities the LED lighting installation provides to life. Mundial is a high power and performance floodlight for all sports applications and large area illumination. With a choice of lamp sizes it gives flexibility over lumen package, colour rendering index and colour temperature. The floodlights at Wembley achieve a switch level of 63 000 lux with an average vertical camera illuminance to camera of 2626 and uniformity of 0,7. Mundial's rear access and automatic power interruption makes it easy to install and maintain. Noel Whiffin, Key Account Manager at Thorn Lighting, explains how the lighting design for the pitch lighting demanded careful consideration: "A preliminary visit to the Wembley site showed that the trusses on the one side of the stadium to support the partially closing roof would create an obstruction to the floodlights. We therefore worked with our software partner Lighting Analysts, to create a full model of the gantry trusses to eliminate the need to move floodlights post-installation. The result was less than 5% obstruction to the floodlights and a fully FIFA compliant lighting design. The floodlights are mounted with two fixings – central bolt and retaining wire – and are mounted up to three floodlights high. To further eliminate obstruction of adjacent floodlights we assisted in the design of the headframes to prevent the beams from being obscured." Bowl lighting is used for all six pitch switch levels in different arrays using Troika 400W metal halide uplights and downlights. Troika is an asymmetric 'flat glass' floodlight for 250-600W discharge lamps with an adjustable lampholder. It is ideal for sport applications and minimises light pollution & glare with excellent light output control. Each lamp option offers four different light distributions for flexibility and performance.The lighting for up/downlighting of the bowl the Troika floodlight is mounted on the inside of the gantry while the lighting for uplighting of the roof the Troika is mounted at the back of the upper level of the bowl. The bowl lighting includes multi-fed electrical supplies for emergencies.